Last month I shared a post which described an overview the personal quality improvement plan, also known as PQI. In today's post, I will walk you through the steps to create or select a tracking log, decide on actions to track, and some tips to make collecting your measurements as easy as possible. Quantified Self is a website and movement dedicated to "self knowledge through numbers." Followers of the this methodology rigorously collect all kinds of detail about themselves from how many hours they sleep, number of minutes exercising, routes walked from Point A to Point B, etc. Quantified Self chapters exist in many cities. When the members connect at gatherings, they share information on how to better collect information about themselves and discuss any insights they may have gained along the way. Nick Feltron has been collecting his personal data and publishing in very artful ways for several years. He collects everything from number of photos taken to pages read to calendar entries, etc. While Quantified Self members and Nick Feltron may enjoy some pleasure in collecting and sharing data, the journey for them seems to be about the process of collecting the data - not using the data collected for some purpose. The collection of measurements for PQI is different. The data that you collect will begin a journey of improvement. For many years, therapists have routinely asked clients to track specific data about themselves (for example, the number of times relaxation exercises are done, the number of times you think about a specific object or person, or frequency of negative thoughts). Additionally, a routine part of assessments for attention deficit disorder in children is for parents and teachers to independently observe the child's behavior to determine the extent that the child is distracted in the classroom and at home. The first step to collecting measurements is to create or select a tracking log. Once the tracking log is created, you will use it to keep a record of selected measurements for 25-30 consecutive days. A small note book is ideal for record keeping. Additionally, you can use an app on your smartphone to record measurements. Another convenient way to track data is to create your own small booklet specifically designed for capturing measurements. 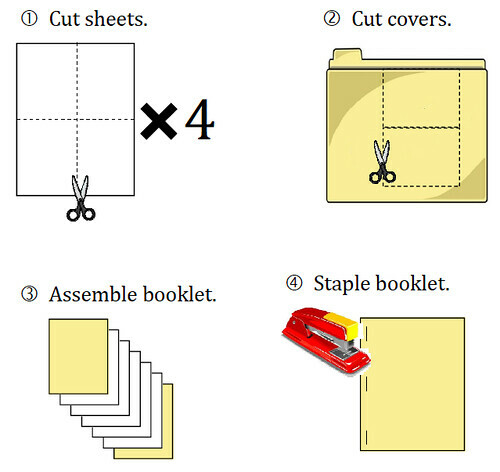 Take 4 sheets of 8.5-inch by 11-inch copy paper (blank), cut in half and in half again. The final size will be 4.25 x 5.5 inches. Using a file folder or card stock, cut out two covers with the same dimensions as the final paper size. Assemble the sheets between the file folder covers. The result is a book with 32 pages for entries. The second step is to identify areas to track. The following guidelines will help you select areas (known as variables) to track and record. Select no more than 3-4 variables. What you are tracking must be under your control (e.g., money spent, minutes of exercise). Because there should be a minimum of 15-20 measurements per variable, select activities that occur every day or frequently. If you select something that occurs less frequently, you should keep recording until at least 15-20 measurements are collected. The areas you decide to track must be of interest to you. The areas must be measurable (quantifiable). Whatever you select must be easy to record without disruption. If you don't record actions as they occur, it is very likely that you will forget to record information later. Likewise, it should not take too much time to record measurements. Be honest with yourself and record accurately whatever you select. Following the instructions above, start tracking 3-4 variables today. If you take measurements every day, by the time I discuss how to summarize your data in next month's PQI posting, you will be ready to proceed.